Precision machined from aluminum. These special chucks are made to accommodate small specimen blocks, which have been polymerized in Eppendorf tubes. In addition, we also have chucks that hold all sizes of flat embedding blocks (fitting all Leica and RMC instruments), and chucks for LKB instruments. Aluminum Microtome Chucks with grooved surfaces for good specimen adhesion. 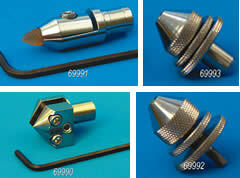 PolarChuck™ cryostat embedding chucks are made of anodized aluminum. Deep rectangular waffle grid or circular pattern creates a more stable and secure tissue mount. Machined from solid Aluminum. They come with set screws and a hex key. Molded from hard plastic. EMS# 70175-50, 6m thick is shown to the right. These polyethylene trays are ideal for casting specimen blocks embedded with JB-4 or equivalents and are used with our block holders and chucks shown above. Molded from polyethylene, three popular sizes are available to meet your needs. 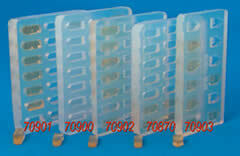 These Individual Molds can be used with EBH2 Block Holders, #70175-50, 70175-60, or with colored stubs 70175-70. Aluminum Embedding Tray is available with 6-position to hold these Individual Mold during polymerization. Comes with anodized blue and natural color. Suitable for JB-4®, JB-4-Plus®, Immuno-Bed, LR White, LR Gold® or Paraffin embedding. A two-directional mold that allows for single embedded specimens to be sectioned both laterally and transversely. Tissues to be embedded are accurately trimmed and placed so that both sides of the tissue are against both edges of the cavity tip. Our molds are made from the strongest possible silicone rubber providing extremely high tear resistance. They are all reusable and produce embedding blocks of numerous shapes and sizes with a wide variety of tips. We also offer a mold which produces blocks to be used for re-embedding. Choose the one that best suits your embedding needs! This 24 cavity mold produces a block similar to the embedding capsule block but with the following advantages: Resin polymerizes better in silicone rubber than in polypropylene or polyethylene - the rubber heats more evenly and retains the heat better than in plastic. Designed by Dr. J.P. Chang for the embedding of a monolayer of cells. This specially designed mold has proven useful in the processing of frozen sections, ascite cells, fresh imprints, as well as blood and marrow smears. J. of Ultrastructural Res., 37, 370 (1971). Observing the ultrastructure of cells under an electron microscope is an important aspect of biological research, especially in the neurosciences. 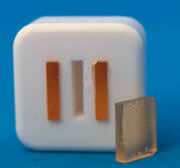 These embedding crystals were designed to simplify the preparation of samples and make the process more time efficient. Preparing a sample for a transmission electron microscope is a long and difficult process. These slice capsules were designed to simplify the preparation of samples and make the process more time efficient. A clear silicone rubber with very high tear strength. It can be reused more times than the conventional silicone molds. It is resistant to most epoxy resins and its clear base allows positioning of the specimen lighted from beneath. Made from clear silicone, the overall measurements are 1.65" x 3" with 12 cavities. Each cavity measures 0.427" L x 0.25" W x 0.156" D (10 mm L x 6 mm W x 4 mm D). This mold produces 12 embedding blocks with tapered ends. A new design with 10 triple numbered, tapered tip cavities to save you time and handling. Holds firmly in a chuck during trimming or sectioning. Made from white silicone, each cavity measures 8mm from tip to center, 5mm Deep. Molded from polyethylene. The critical surfaces of the mold are transparent, facilitating accurate specimen orientation through bottom illumination. Molds are reusable and each mold is supplied with a protective box. 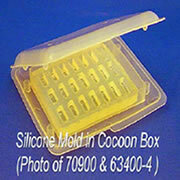 Most resins are no longer a challenge to flat embed when used in combination with the Cocoon box. The system withstands temperatures up to 70 Degrees C, and our flat embedding of many resins is made easier. Machined from PTFE block. 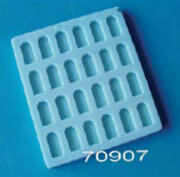 This mold offers flat embedding for most resins, including LR White®, LR Gold®, JB-4, Immuno-Bed and Lowicryl®. This PTFE Flat Embedding Mold can be used for both UV/low temperature and thermal cure, and may be used as a substitution for the silicone molds. The individual cavities are pre-shaped to reduce block trimming. For curing anaerobic material, we recommend using Aclar® film, cut-to-size of the mold and lower on top of the mold after you 'just over-fill' the cavities with embedding resin. Due to the flexibility of the PTFE, you just bent the mold to pop out the cured resin blocks. After all the cast blocks have been removed, reinsert the mold to its holder to re-shape the mold. The mold holder is machined from aluminum and anodized black. Mold is available as a set (includes one PTFE mold and one aluminum holder). 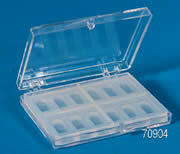 Use our EMS Pyramid Tip Mold for sample preparation of difficult to orient specimens. The tips attach to plastic cylinders easily and quickly. When the tip is mounted, it has the same dimensions as our Beem® Embedding Capsules, Size 00, 8mm I.D. Our EMS Square Face Mold features a wider tip area, which is perfect for embedding larger specimens with less resin, resulting in a larger initial section. Once solidified, the block can be glued to the end of a plexiglas rod or other holding device. Made of Lucite, these EMS Mounting Cylinders have smooth ends for attaching pyramid-tips easily. This deep well mold offers an inner depth of 11mm with a width of 35mm. The inner cavity has 66 cavities. Each cavity is 3⁄16" (4.7mm). Labelled A-F horizontally and 1-11 vertically. The overall dimensions of the mold are: 1¾ x 2¾ x ⅝" (45 x 70 x 16mm) thick. The inner dimensions are: 1.37 x 2.36 x .43" (35 x 6 x 11mm). 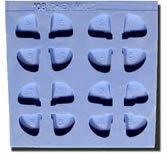 The molds have been tested to withstand up to 225° C. They are available in blue silicone or clear. This unique silicone mold comes in 3 different types of silicone, clear, white and blue, and has 2 different cavity sizes to meet all of your embedding needs. A clear flexible LDPE mold. A great idea if you do not want to clean the molds. Same as our flat embedding silicone molds. EMS Embedding Mold is a new mold designed with Michael J. Dykstra Ph.D. from North Carolina State University Department of Veterinary Medicine. This Mold produces blocks of the best dimension to be held securely by Reichert/Leica Ultracut stepped microtome chucks. There are 24 cavities and the depth of each cavity is 4mm which will prevent breakage of the blocks during razor blade trimming. These molds are reusable. Each cavity measures 12mm L x 5mm W x 3.5 mm D. Overall mold measures: 94 x 56 x 14 mm. This invention is a mold used for embedding mammalian cells in monolayer culture in preparation of sectioning for light or electron microscopy. Tissue culture monolayer embedding molds eliminate the need for traditional BEEM® capsules. The improved molds can be used to transfer the majority of cells from the entire surface of a cover slip to avoid losses of large amounts of cellular information occurring only randomly. In addition, other problems such as surface blemishes caused by air entrapment associated with BEEM® capsules are eliminated. The same design as above 70170 but with the addition of three round cavities which are 17 mm in diameter and 1 mm Deep.